Phil Mickelson picked up a golf club when he was only 18 months old, mirroring his father’s swing so well that even though he was right handed at everything else, he developed a mighty left handed swing. Mickelson continued his golfing at Arizona State University where he was able to fine tune his skills on the course. The year 1992 was a very memorable one for Phil; he graduated college with a degree in Psychology and made his PGA debut at the US Open. Since his debut, Phil has achieved 42 PGA wins earning him a much deserved spot as number 9 on the all time wins list. Mickelson won the 2004, 2006, and 2010 Masters, 2005 PGA Championship, and the 2013 Open Championship, making him only a U.S. Open win away from completing golf’s grand slam of winning all four major tournaments. Further testimony to Mickelson’s remarkable talent is the fact that he is the only U.S. player to appear in all seven President’s Cups and has also been selected for nine Ryder Cup teams. Recognizing the importance of passing down the great tradition of golf, Mickelson serves as co-Chairman of the American Junior Golf Association where he helps youngsters achieve their own dreams of becoming Golf Champions. 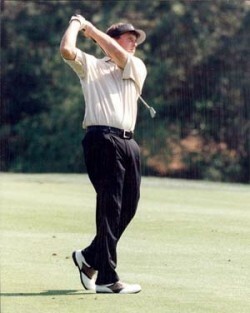 Phil was inducted into the National Italian American Sports Hall of Fame in 2008 and the World Golf Hall of Fame in 2012.